Spartacus: A Game of Blood & Treachery is an exciting game of twisted schemes and bloody combats inspired by the hit STARZ Original series. 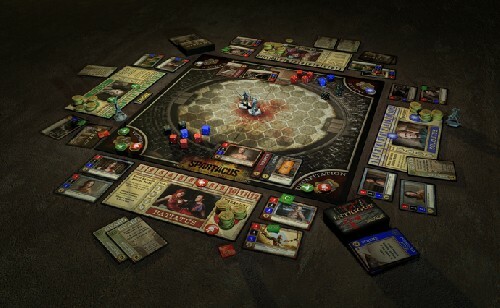 Players assume the role of the Dominus of a great house competing for influence in the era of ancient Rome. Players vie for dominance through careful diplomacy, cunning intrigues and the glory of the Arena. Undermine the machinations of rivals, leverage your wealth for advantage at market and pit your gladiators in bloody contest all with the goal of seeing your house rise to supremacy.